When thirty-two-year-old former lawyer Joseph Medill bought a controlling stake in the bankrupt Chicago Daily Tribune in 1855, he had no way of foreseeing the unparalleled influence he and his progeny would have on the world of journalism and on American society at large. Medill personally influenced the political tide that transformed America during the midnineteenth century by fostering the Republican Party, engineering the election of Abraham Lincoln and serving as a catalyst for the outbreak of the Civil War. The dynasty he established, filled with colorful characters, went on to take American journalism by storm. His grandson, Colonel Robert R. McCormick, personified Chicago, as well as its great newspaper, the Chicago Tribune, throughout much of the twentieth century. Robert’s cousin, Joseph Medill Patterson, started the New York Daily News, and Joe’s sister, Cissy Patterson, was the innovative editor of the Washington Times-Herald. In the fourth generation, Alicia Patterson founded Long Island’s Newsday, the most stunning journalistic accomplishment of post–World War II America. Printer’s ink raged in the veins of the Medills, the McCormicks and the Pattersons throughout a century, and their legacy prevailed for another five decades—always in the forefront of events, shaping the intellectual and social pulse of America. At the same time, the dark side of the intellectual stardom driving the dynasty was a destructive compulsion that left clan members crippled by their personal demons of chronic depression, alcoholism, drug abuse and even madness and suicide. In THE MAGNIFICENT MEDILLS, author Megan McKinney describes a century of newspaper publishing that covers four generations of the Medill-Patterson-McCormick family. Along with Randolph Hearst, this dynasty ruled the United States newspaper industry into the 1950s. It all began in 1855 when Joseph Medill purchased a stake in the bankrupt Chicago Daily Tribune. Joseph Medill became very influential in Chicago and was an important character in Abraham Lincoln’s rise to the presidency and in the creation and naming of the Republican Party. Medill’s daughters married into the wealthy Patterson and McCormick families, establishing a strong presence in Chicago from where they would influence politics, culture and journalism for many years. Medill’s grandson, Colonel Robert McCormick, established the Tribune as the leading newspaper of the first half of the twentieth century. Another grandson, Joseph Patterson, did the same for the New York Daily News. Patterson’s sister Cissy had a successful run with the Washington Herald while leading women into the field of journalism. Cissy’s daughter Alicia earned her success at Long Island’s Newsday. Megan McKinney shares some great newspaper stories with the reader. For example she tells of Joseph Patterson development of comics as a staple of the daily newspaper and how gangsters played a significant part in the Chicago bloody newspaper circulation wars in the early 1900s. But the real thrust of the book is the detailed accounts of the lives of Robert McCormick and Joseph and Cissy Patterson. THE MAGNIFICENT MEDILLS is really a story about wealth and access to the powerful people in government and industry. It’s also a story about extravagance, addiction, suicide, adultery, and gossip. The book gives credence to the adage that truth is stranger than fiction. McKinney places the family members in a historical perspective by including stories of many familiar people such as Lincoln, the Wright Brothers, Teddy Roosevelt and his daughter Alice, Franz Josef, Nicholas II, Franklin and Eleanor Roosevelt, and John Kennedy. Even Madeline Albright, former Secretary of State, had a place in this story. Because there were so many characters in the book with similar names I had difficulty keeping them straight. The author did present a family tree at the beginning of the book but I found it difficult to use as a reference. Also, I would have preferred more details on the family’s newspaper business and less on their private lives. 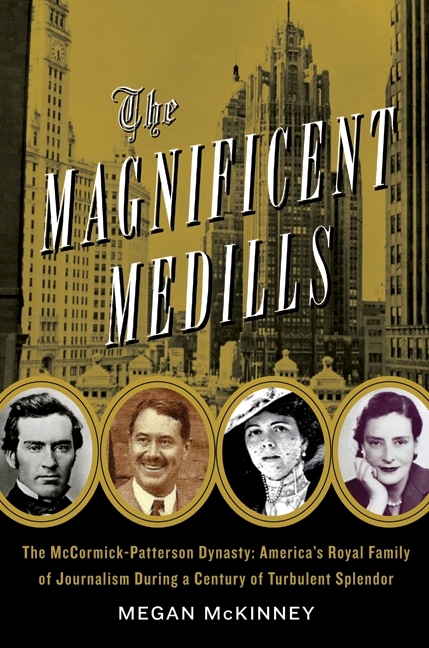 If you’re interested at all in the history of journalism and the lives of the rich and famous people who influenced the newspaper business when it was truly relevant, then I think you will enjoy THE MAGNIFICENT MEDILLS. Thanks to Booking Pap Pap for his review and thanks to the publisher for sending a review copy. I'd seen this book around and had been wondering about it. Nice job Pap Pap! I'm not much of a non-fiction reader, but I'm drawn to this book. May have to pick it up dip into. Enjoyed the review, Booking Pap Pap (AKA Julie's Dad). I have a feeling my mom would love this book just because it does focus on their personal lives and not their business lives. The fact that she grew up near Chicago would make it all the more interesting. I'll have to ask her if she's heard of the Medills. I just read Erik Larson's Devil in the White City. It's a great book about Chicago at the end of the 19th century. It's a true story of an architect genius, and of an evil serial killer. I just posted a review on my blog (www.educationdiva.com) if you are interested in reading more. I will definitely be looking at "The Magnificent Medills."